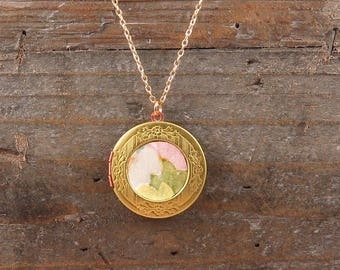 A round vintage gold locket with a recessed front and floral etching, is adorned with 1970s floral vintage wallpaper that I hand cut myself. The wallpaper has florals in shades of pink, coral, gold, lavender. The wallpaper has been glued on the locket and sealed with a sealant. Do not get this wet!!! 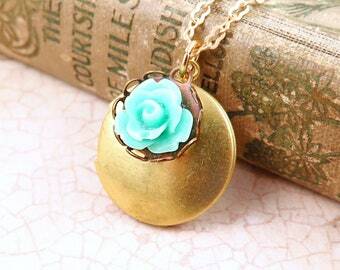 Locket is lead and nickel free. Gold plated chain (lead and nickel free) and gold plated lobster clasp. 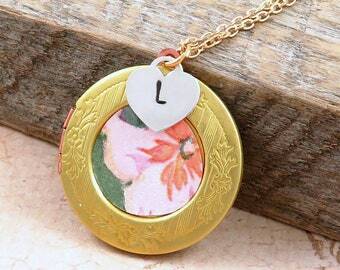 Locket measures 30x30mm. 1. 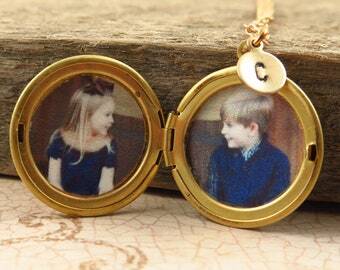 The locket you receive will be SIMILAR to the photo but not exact as each one is a little different. 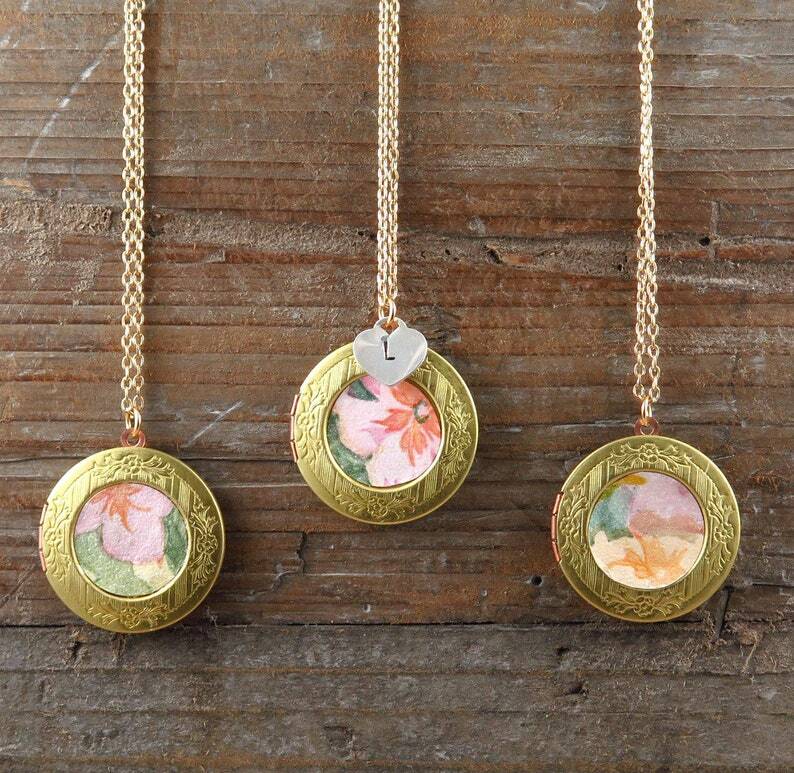 You will receive a locket similar to any of the one's in the last photo. Let me know if you want more pinks, oranges, yellows or purples and I will do my best to make that happen. Because it's vintage wallpaper and the pattern varies a bit, each will be a little unique, but all beautiful. 3. 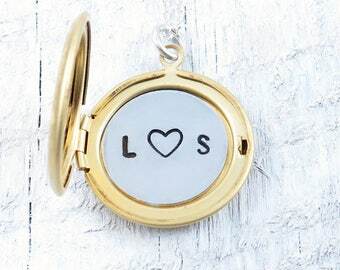 You can choose the locket alone or add a gorgeous sterling silver heart hand stamped initial to make it more personalized. If you choose the initial please let me know the letter at checkout. Most of my designs are made to order, with average production time at 1-3 business days but can take up to 5 days sometimes. Please check SHIPPING & RETURNS under "add to cart" to see the production/shipping time for the item you are ordering. If you need it sooner, please leave a message in the "note to seller" so I can try to speed things up for you! Every order has a choice to expedite your order, either PRIORITY MAIL (2-3 business days shipping time, on average) or OVERNIGHT. All my designs come inside a Kraft natural colored box with pretty designs on the front and a pretty ribbon. Gift wrap can be purchased as well. Visit my shop for more great Jewelry finds! If ordering more than one item, state if you want them wrapped together or individually. Please also be sure and specify occasion in note to seller. Love the simple look of these and happy with service I received. I heard from her as soon as she received the order as well as when they shipped. Would definitely consider ordering from her again. Lauren was so helpful. She answered all my questions quickly, even before I made the purchase. I am so sorry you are not satisfied with the locket. My number one priority is for my customers to be happy. 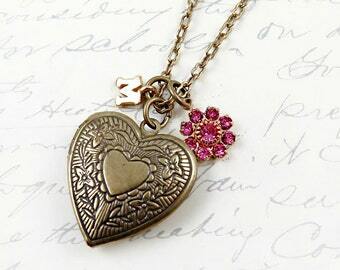 If somehow your locket had any irregularities I'd want to remedy that for you. 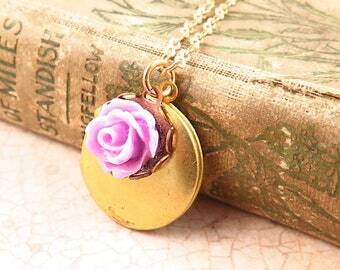 I did not receive communication from you that you were not happy so I reached out and offered you a full refund if you wanted to return the locket. Thank you. Once an item has been purchased, please pay for your item through Paypal or Direct Check Out. If you pay with an echeck via paypal, your item will ship when the echeck clears. Tax of 4.35% will be added to Colorado sales. 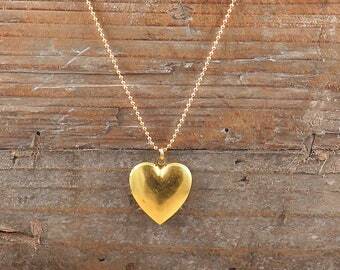 I want you to love your Lauren Blythe jewelry! All my designs are created by hand, for you. If you have received your order and have any concerns please contact me so we can remedy the situation as customer satisfaction is my number one priority! If you must return your item, please contact me within 7 days of item's receipt, and the item needs to be returned within 14 days with delivery confirmation and preferably in the same gift wrapped box, unworn. Please DO NOT send it with signature requirement or certified mail as this will only delay your refund since that will require me extra time to go to the post office to get your item. You may receive a refund (minus shipping costs) or an exchange. I will only refund shipping if it's an error on my end. 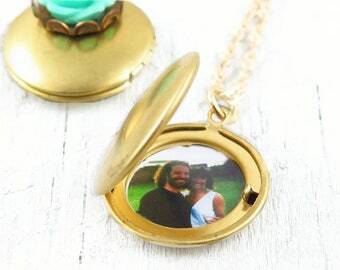 I do not accept returns on special orders which includes custom orders, locket orders with photos or that are personalized, personalized necklaces, Eastern globe locket necklaces, or orders of large multiples for special occasions, bridesmaids, etc. This is due to the time involved in creating each piece by hand so be sure to order carefully. Any orders returned after the 14 days will only be given a store credit. Since most items are made by hand by me, your Item(s) will ship according to my production time listed on my main shop page which is usually 2-5 days (please allow extra time for larger orders) of confirmed payment to the address provided on ETSY not Paypal, sometimes sooner. It is helpful if both addresses match. If I need more time to create your items I will contact you. Shipping costs for all countries include handling too (padded mailer, gift box, etc.) Production time does not include shipping time. I ship via USPS First Class, Priority Mail or Overnight. This does not include insurance towards loss and damage. If you require that, please contact me BEFORE placing your order. I do use delivery confirmation on all orders. The Buyer is responsible for paying all customs fees, taxes, and duties they may be charged by their country PLEASE check with your Postal Service before ordering. Items can NOT be marked as gift as this is illegal and a federal offense. PLEASE NOTE: Orders to Canada take from 10-16 days while other International orders can take up to 30-45 days (6+ weeks) to reach their destination. Please plan accordingly. If you do not see your country listed please drop me a line and I will let you know a rate. Your jewelry is beautifully wrapped in jewelry boxes or gift bags and tied with a ribbon. I will combine items in order to conserve packaging materials (unless you specify otherwise) and I no longer include the receipt as you can view and print it online now at Etsy. All my shipping envelopes for jewelry are padded. If you want additional gift wrap (wrapping paper and bow) you can order that when you check out for an additional charge. ♥Custom Orders? Yes am happy to! Please email me and I'd be happy to accommodate your needs. Depending on how customized the item is, I would need 50% of payment prior to creating the item. ♥Love something you want held for a few days? Please convo me to reserve the item! Just please be sure to come back and purchase that item or if you change your mind, to let me know. I will hold reserves for 3 days. ♥For Buyers: When you receive your order, I encourage you to leave feedback on Etsy. Your feedback tells me that you have received your items, are happy with the merchandise, and consider our transaction complete. I leave feedback once your end of the purchase is complete. ♥Wholesale? yes please contact me for information. I normally do not do wholesale during my very busy time between October and March. Please take care of your jewelry by keeping it clean and away from water, soaps and lotions. Please remove before bathing, swimming or exercising. Store your jewelry pieces in a jewelry box or air tight container. All designs are mailed in a natural Kraft box with a pretty label or washi tape and a bow. Ready for gift giving! If you want your item gift wrapped also in wrapping paper and pretty bow and tag, there's an additional charge for that you can choose upon check out. We welcome them! Custom orders require payment before work begins. Photo of final design will be sent for approval. Custom orders are not returnable. Please contact me for Wholesale information!